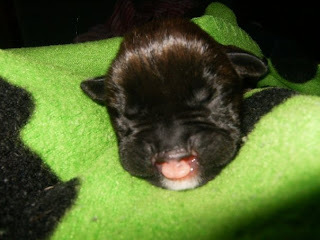 The tiniest little 4 day old puppy arrived today. He's so small and fragile and thin. I'm truly amazed that we made it home. His tiny size gave us so much of a shock - we really weren't prepared for such a small little guy. Just catching up on your earliest posts. What an undertaking to care for such a young, high needs pup. Brosa was lucky to have you. Thanks Sybil! The kudos go to Lee Anne Tibbo of Boxer Rescue Atlantic Canada - she was his saviour!